This page shows you the layout of your bill and explains what happens with monthly/recurring charges if this is your first bill, you’ve changed plans, or changed ownership. Our glossary of billing terms provides a detailed explanation of charges that may also appear on your account. We're currently upgrading our billing systems, so if your account number starts with an 8, 9, or 10, click here. Otherwise watch this video, or you can read an explanation below. Details of the summarised charges are in My Optus app, or view them in My Account. Additional 1GB allowance charged at $10 (inc. GST) as data usage has exceeded available data allowance. Any credit or debit adjustments applied to your account since the last bill (excl. GST). Optus Yes TV content (TV or Movies). Charges for TV packs are in monthly blocks and are not pro-rated. A 'Community call' is a call that would otherwise be charged at National call rates. With community calls, the charging zone in which the calling party is located is not adjacent to the charging zone in which the called party is located. However, Optus has designated the two areas to have a community interest and therefore charges a reduced 'Community Call' rate between the two areas. More information is available in the Home Phone Standard Form of Agreement (SFOA). Premium Services at an additional cost usually provided by a third party provider. If you have a Fetch service that's bundled with your Fixed Broadband or Bundled account, the service, rental or TV channel pack charges can be found under ‘Content Services’. The ‘Supplier’ column confirms that each charge relates to Fetch. Support to manage third party content & spend control is here. Payments made via credit, debit or charge cards incur a 0.427% (incl. GST) payment processing fee. Additional data allowance added to the service plan data inclusion. Amount of shareable data contributed by a service. Fee of $15 that may apply if the total bill amount is not paid by the due date. Pre-purchased pack $10/day to get 200MB data to use in Zone 1 Countries. Multiple days bought as a single pack allows you to use your total data allowance over those days. Immerse yourself in the latest TV shows, movies and special events. See this page for more information. Charges that recur monthly - this includes base plan charges, bolt-ons and device instalments. If this is your final bill after disconnection, click here. A one-off fee to return a current device in good working order and get a brand new one on a new eligible 24-month plan. See New Phone Trade Up for more information. $2.20 fee applied if account is not paid via direct debit. This fee can be avoided if paying with direct debit. Additional one-time charges or credits not part of the plan, like Travel packs, connection, or delivery fees. Mobile calls that are not included in your plan benefit, these may be charged or already be rated as zero ($0.00). Customers who are eligible to receive their bills via My Account, but choose to also receive paper bills may incur a $2.20 Paper Invoice Fee. To avoid this fee simply register for My Account and switch to convenient online billing. Payments made via credit, debit or charge cards incur a 0.427% (incl. GST) payment processing fee. For a fee free alternative you can set up direct debit today. A pro-rata or part month charge is a charge for only part of the month. Located under ‘Recurring charges’: A pro-rata (part-month) charge from when the plan was activated until the end of the bill cycle. Charge to physically move a service. Charges for usage made outside of Australia via our overseas carrier partners. Charge for replacement of Optus TV featuring Foxtel smartcard. Charge for installation of Optus TV featuring Foxtel. Pre-purchased pack $10/day to get Unlimited Talk & SMS, plus 100MB data to use in Zone 1 Countries. Multiple days bought as a single pack allows you to use your total data allowance over those days. Usage related to voice calls, SMS, MMS, content and data generated by your service. You can check and manage your usage via My Optus app, or My Account. Content/Premium Services are at an additional cost, usually provided by a third party provider. Support to manage third party content & spend control is here. 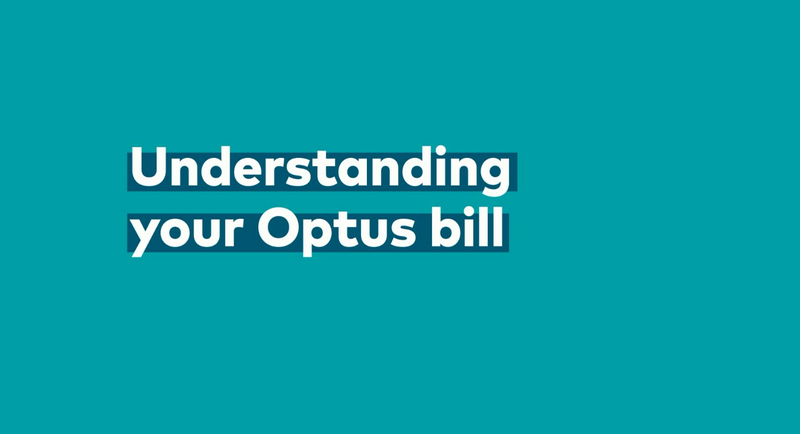 You can view detailed usage for your current bill and manage your account via: My Optus app, or My Account.